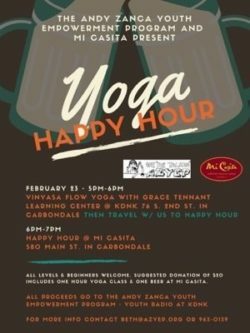 KDNK Community Access Radio, 76 S. Second St.
Join the Andy Zanca Youth Empowerment Program in Vinyasa Flow Yoga Happy Hour with teacher Grace Tennant on Friday, February 23rd from 5:00 to 6:00 PM KDNK Carbondale Community Access Radio. Then travel with us to Mi Casita Carbondale at 580 Main Street for libations. Suggested donation of $20 dollars includes a one hour yoga class and a beer. All proceeds benefit the Andy Zanca Youth Empowerment Program. This event is 21+. 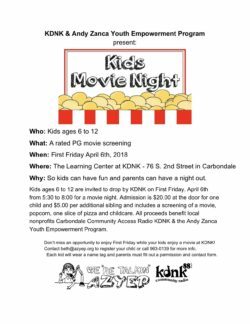 KDNK and the Andy Zanca Youth Empowerment Program will host a Kids Only Movie Night on First Friday, April 6th. 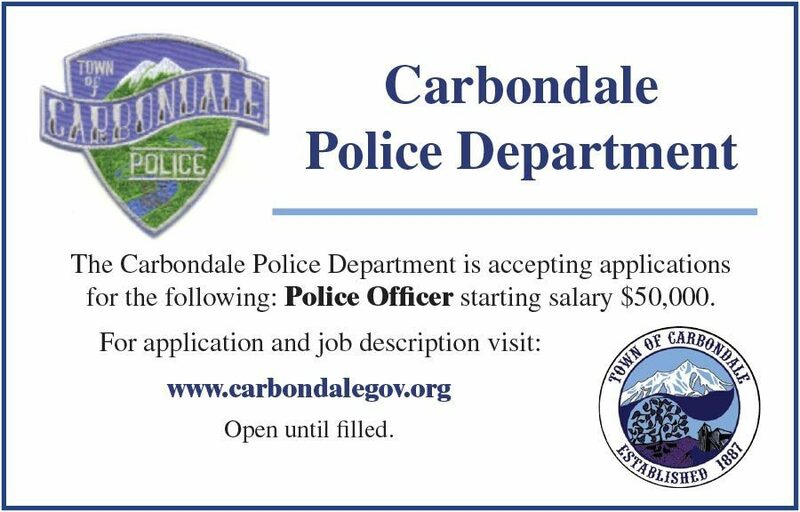 Kids ages 6 to 12 are invited to the station from 5:30 to 8:00. The event is 20 dollars for one child and $5.00 per additional sibling and includes a movie screening, popcorn, one piece of pizza and child care. Parental permission form required. 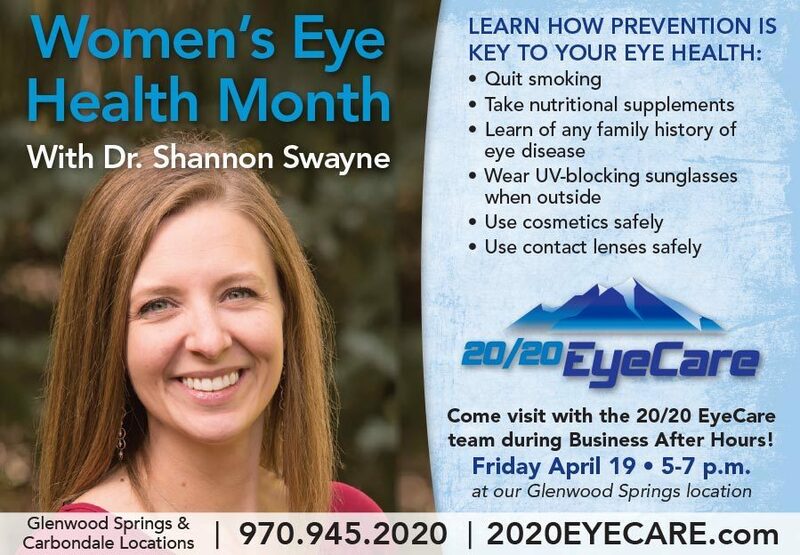 Contact Beth@azyep.org or call 963-0139 for more information. 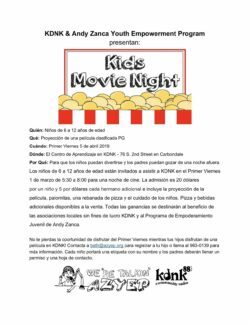 KDNK and the Andy Zanca Youth Empowerment Program will host a Kids Only Movie Night on First Friday, November 2nd. Kids ages 6 to 12 are invited to the station from 5:30 to 8:00. The event is 20 dollars for one child and $5.00 per additional sibling and includes a movie screening, popcorn, one piece of pizza and child care. 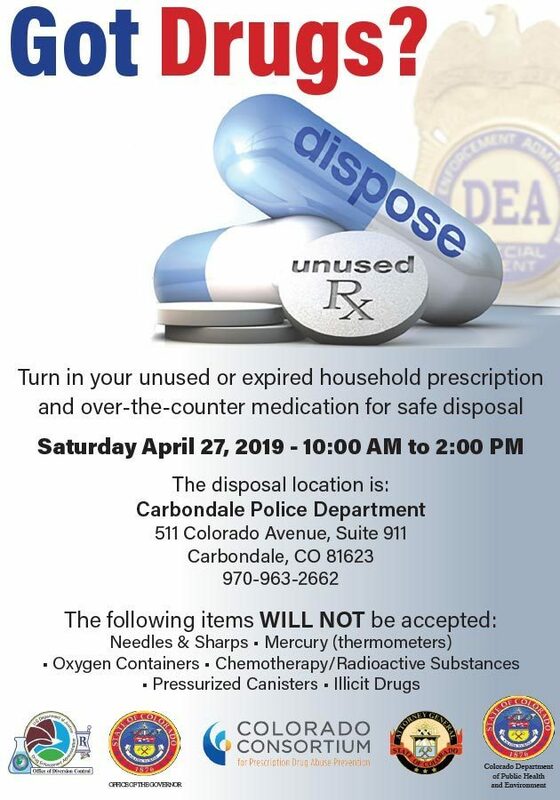 Parental permission form required. 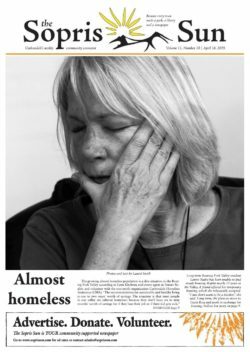 Contact Beth@azyep.org or call 963-0139 for more information. KDNK and the Andy Zanca Youth Empowerment Program will host a Kids Only Movie Night on First Friday, January 4th. Kids ages 6 to 12 are invited to the station from 5:30 to 8:00. The event is 20 dollars for one child and $5.00 per additional sibling and includes a movie screening, popcorn, one piece of pizza and child care. Parental permission form required. Contact beth@azyep.org or call 963-0139 for more information. 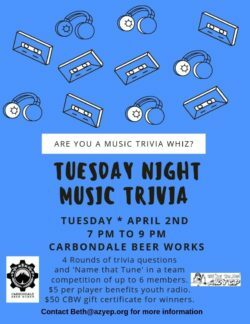 Join the Andy Zanca Youth Empowerment Program and Carbondale Beer Works in four rounds of trivia questions and 'Name that Tune' in a team competition of up to 6 members. 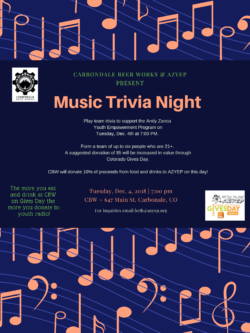 This 21 and up event benefits the Andy Zanca Youth Empowerment Program. A CBW gift certificate goes to the team winners. Come early to reserve your seat. 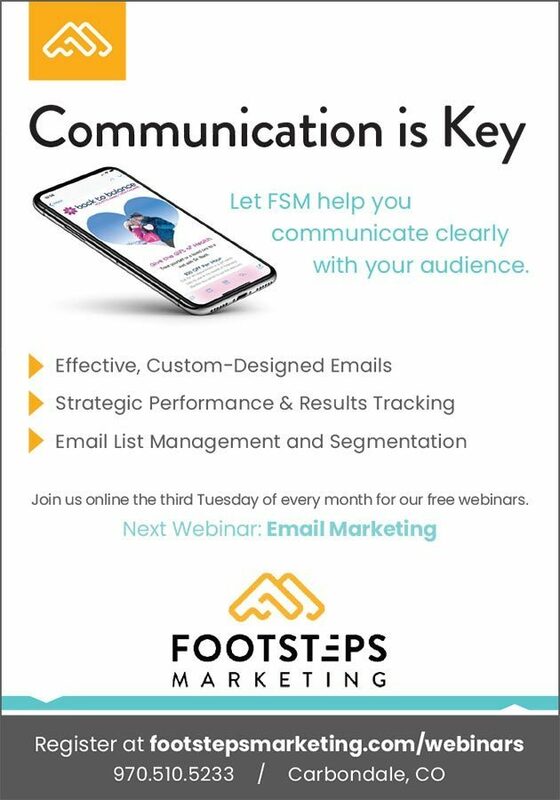 Contact beth@azyep.org for more info. Kids ages 6 to 12 are invited to drop by KDNK on First Friday, March 1st from 5:30 to 8:00 for a movie night. Admission is $20.00 at the door for one child and $5.00 per additional sibling and includes a screening of a movie, popcorn, one slice of pizza and​ ​childcare. 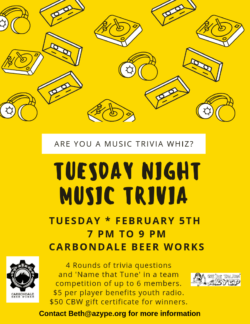 All proceeds benefit local nonprofits Carbondale Community Access Radio KDNK & the Andy Zanca Youth Empowerment Program.